Microsoft introduced numerous software design and architecture changes in later versions of the Windows OS environment beginning with Windows 8. Several of these changes impact the video display system and its ability to communicate with E-Prime. E-Prime 3.0 and E-Prime 2.0 SP2 are compatible with Windows 8, 8.1, and 10. However, specific DisplayDevice settings are required when designing and running experiments in these environments. The warning message shown below appears when attempting to run the experiment from E-Studio when the settings are not properly configured. This article describes the conditions that cause this warning message to appear and the experiment settings that must be used to eliminate this warning. The solutions below require modifications to the DisplayDevice settings. To access the DisplayDevice in E-Studio, double click the Experiment Object properties pages > Devices tab > DisplayDevice. 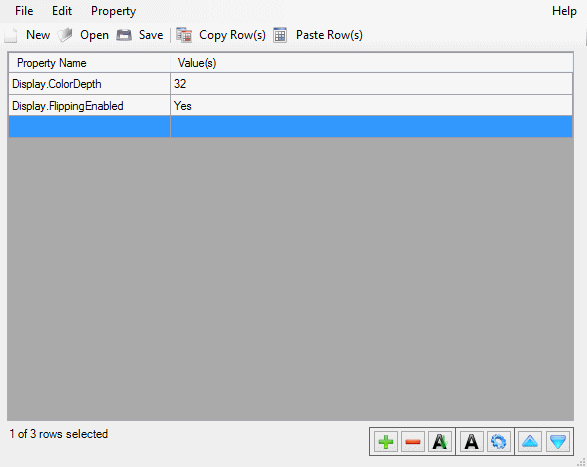 Then, click the 'Edit' button to access the DisplayDevice properties. Previous versions of the Windows OS and E-Prime supported 8-, 16-, 24-, and 32-bit color depth. However, due to changes in the Windows Desktop Manager (WDM), Windows 8 and beyond supports 32-bit color depth only. When a new experiment is created in E-Prime 3.0 under these OS environments, E-Prime sets the DisplayDevice's color bit depth to the required value of '32'. However, when an experiment that was created in a prior version of E-Prime is loaded into E-Prime 3.0, E-Prime keeps the originally specified color depth setting. NOTE: Some display adapters are capable of using a color depth of less than 32 in Windows 8 and beyond. However, despite this ability, PST does not recommend running the software under such environments which are not native to the operating system and therefore not conducive to accurate timing. E-Prime 2.0 introduced the option of using display flipping (also referred to as 'page flipping' or 'back buffering'), which is another tool which helps to ensure that displays are synchronized to the vertical refresh rate of the monitor in order to help avoid screen tearing (INFO: DisplayDevice.FlippingEnabled ). For E-Prime 2.0, display flipping was encouraged but not required. However, since Microsoft made changes in their support of DirectX 7 under Windows 8 and beyond, E-Prime 3.0 uses DirectX 11 hardware acceleration for proper compatibility and timing accuracy. 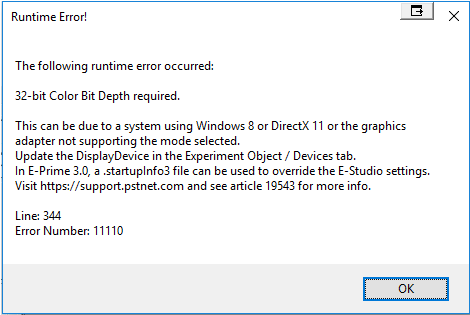 The use of DirectX 11 requires that display flipping must be enabled when running E-Prime 3.0 in a Windows 8, 8.1, or 10 OS environment to maintain timing accuracy. Display flipping is enabled by default for all new experiments created within E-Prime 3.0. However, when an experiment that was created in a prior version of E-Prime (such as E-Prime 2.0 SP2), E-Prime 3.0 keeps the display flipping settings of the original file. Therefore, E-Prime 3.0 has added a protocol which determines if the machine is operating in Windows 8 or beyond. If the criterion is met, E-Prime determines if display flipping has been enabled. 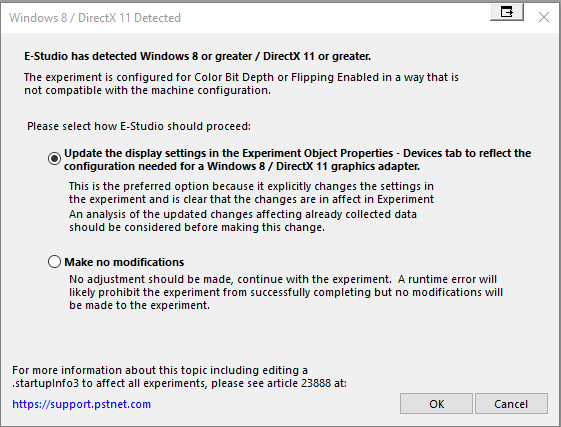 NOTE: DirectX 11 was introduced with Windows 7; experiments run within Windows 7 are not required to use display flipping to obtain accurate display timing, although display flipping is always encouraged under normal experiment design circumstances. Additionally, caution must be used when working directly with the Canvas object or using Inline script with display flipping. Display flipping is only required when running the software in a Windows 8, 8.1, and 10. 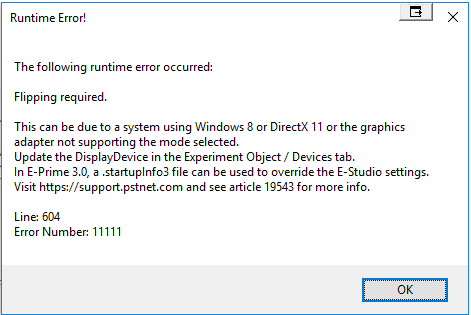 NOTE: E-Prime 2.0 SP1/SP2 requires specific DirectX 11 settings; see INFO: E-Prime 2.0 SP1/SP2 requires specific DirectX 11 settings  for details. There are several solutions available which will allow you to make changes to the DisplayDevice settings and limit the occurrence of these messages. When the warning message shown earlier appears, select the first radio button to update the DisplayDevice settings. E-Studio sets the color bit depth of the DisplayDevice to '32', sets the FlippingEnabled property to 'Yes', and saves the experiment before it is generated and run via E-Run. This solution only makes the change to the current experiment. After E-Studio changes the DisplayDevice settings and saves the .es3 file, the message no longer appears for the experiment. However, this warning message appears for any other experiment files that have not had the DisplayDevice settings modified for color depth and display flipping. NOTE: This solution is for E-Prime 3.0 and E-Prime 2.0 Professional users only.